Available from Spitting Pig North Wales is a smorgasbord of distinguishable menus that make for a first-rate spit roast catering experience no matter the weather. All events should have in common the trait of being enjoyable, for you and your guests. To set in stone an event with genuine entertainment and interaction value for your guests you need great catering, and you should know that at Spitting Pig we have the culinary foundation to make toothsome food of excellent standards. The secret to all lush hog roasts is to keep it simple. There’s no reason or benefit to over complicating a hog roast in Ruthin. 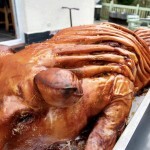 The less you do to the pig before and after cooking it, the better it is. 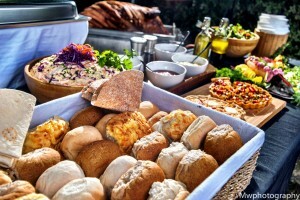 When we make hog roasts, tray cooked or spit roasted, we keep our special seasoning of herbs and spices down to an absolute minimum, so that the true great taste of the free range local pig comes through – and that’s why we serve the pigs we roast on fresh bread rolls with only apple sauce and stuffing. So many of the greatest foods in the world are kept simple and uncomplicated, and hog roasting is no different. Why Choose Spitting Pig North Wales? Catering by Spitting Pig is always about delightful food served to elite-standards, but it’s not always about roasted pig. 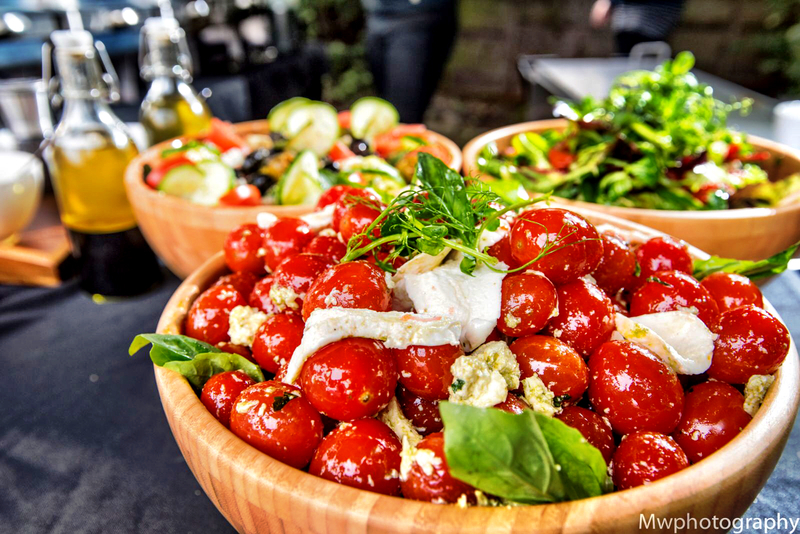 Just as crucial to our catering and, in many cases, even more popular is the menu choice of roasted beef, turkey, chicken, lamb or kebab, or the final choice of grilled, chefs-own sausages and burgers. Each of these tantalising selections are gently seasoned with select herbs and spices, served on crusty bread rolls with their own unique sauces. There’s an excess of different choices to be made for your event menu. You don’t have to settle for just one roast sandwich option though, depending on the menu option you choose you’ll be able to select out two, sometimes even three, of your favourites, so that your guests have greater choice and fully enjoy the event. Choose from any of the earlier mentioned main courses, and more – in the way of salads, canapes, starters, etc – for a dream menu that will compliment perfectly your event. If you’re not entirely happy with the menu selections that we can offer to you then call us, because with our help you can create your own. We’re committed to giving each client a service befitting of a king and we’ll do just that when we offer to make special menu arrangements and even provide you a bespoke menu for your event. Event specific menus are one of the great things about Spitting Pig North Wales. Event specific menus are menus that we’ve created for each different type of events, at the moment we have menu sections for a wedding event, corporate event or a party event. It’s that much easier with our menu categories to find a menu that you want. Finding a hog roast Caernarfon menu you like and booking it can be a real hassle when doing so with other caterers, but not with us. We get our pigs, like our chicken, beef and lamb, from farms in North Wales. The produce that we buy doesn’t just come from any farm either; it’s from salt of the Earth independent Welsh farmers who practice free range organic farming. The benefit of free range organic farming is that it’s ethical and planet-friendly, and it also is really good for the taste of the food. The ingredients are given the time and natural environment to develop as best as possible and that transitions right onto your plate with even more delicious tastes and textures with a hog roast in Dolgellau. It’s precisely because of our exuberance for hog roasting that we set about putting into motion our own production line, a production line that creates North Wales most arresting hog roast machine specimens. We wouldn’t be able to make a splash as big as we do, at all events, if it wasn’t for the fact we make our own tremendous machines. 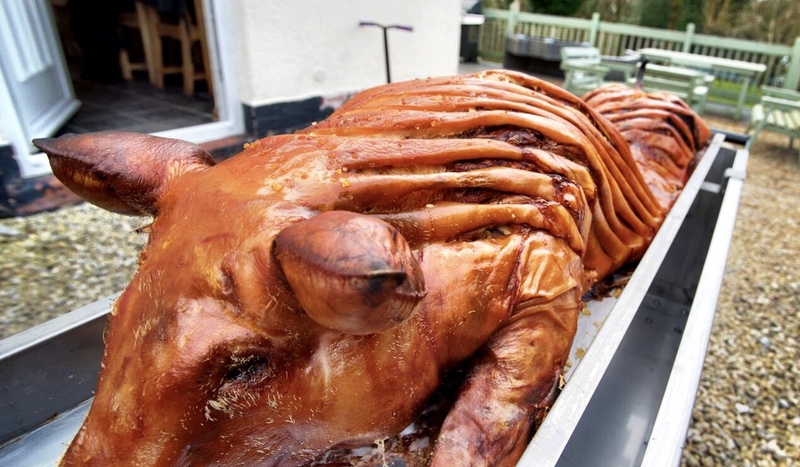 Making our own hog roast Pwllheli and spit roast machines is so important because without them we simply wouldn’t be able to cater so many various menus and dishes for the spectacularly good prices that we do. Specially constructed, purpose-built hog roast and spit roast machines mean that we fry, steam, boil and grill our fresh organic produce while simultaneously making the spit roast. Rather than having to bring loads of equipment and a whole portable kitchen we can do most of what we do with a single hog roast or spit roast machine. It’s incredible what we can do, people are often shocked by the food on our menus because they just aren’t used to hog roast specialists having the knowledge and equipment to effortlessly construct event favourite foods. We also possess more than just ingenious menus. Even though there’s no better than hog roast Llandudno catering from Spitting Pig, hog roast machines hired from Spitting Pig to make your own hog roasts run a very close second. With a hired hog roast Porthmadog machine you’ll find that creating a hog roast of real quality taste, with the same visual merit as a hog roast made by us, without much effort needed on your behalf. Whether you’re looking for a menu for us to cater for you or you’re stealing menu ideas because you’re hiring a machine from us and need inspiration, you’ll find in each section an ambrosial selection of top of the range spit roast menus.